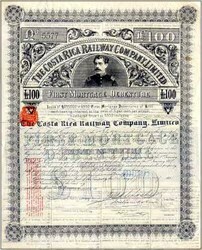 Beautifully engraved Second Debenture Bond Certificate from the Costa Rica Railway Company issued in 1890 in English Pounds. This historic document was has an ornate border around it with a picture of the Senior Bernardo Soto, President of Costa Rica at the time. 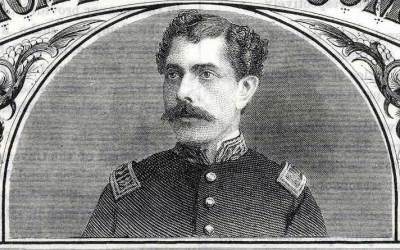 The inauguration of the 102 mile Costa Rica Railroad on December 7, 1890 was one of the most significant events in the history of the country. It vastly improved the ability of the country to export their vital bananna and coffee crops which were vital to their economy.